Bio | SNWEB.ORG Photography, LLC. Sean Doerr has been documenting the city where he lives, works, and plays since the age of 14. The Detroit resident’s photographs have been featured in many publications and websites. 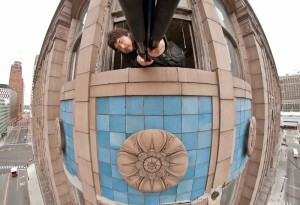 In addition to photographs, Sean has served as a location scout for many feature films looking for unique settings that can only be found in Detroit, and has lectured at various locations about Detroit history and architecture. Sean was born and raised in the Detroit suburb of Wayne. At age 12, he was exposed to a pre-Depression vaudeville theater that had been largely forgotten. Within a few years, he had established himself as a photographer documenting abandoned and neglected architecture around metro Detroit. On a mission, he set out to photograph these irreplaceable locations before they were erased from the planet, either by mankind or the elements. As the major skyscrapers and buildings that he needed to visit and document started to dwindle, he branched out to other types of photography. Sean Doerr is a graduate of College For Creative Studies school with a bachelor’s of fine arts degree with a major in photography and a minor in entertainment arts (video). Armed with years of experience and a four-year degree to strengthen his skill-set, Sean continues to work various jobs and commissions, shooting anything from weddings to buildings to portraits. Clients include: Crain’s Detroit Business, Walbridge, The Associated Press, Detroit Free Press, Getty Stock, Wall Street Journal, Detroit Fire Department, Eliptipar, Michigan History Magazine, PBS, Smartershows, Royal Oak Music Theatre, U-Haul, MLive.